Canadian BlackBerry maker Research in Motion yesterday announced the hiring of two new senior executives, one of which is set to become the new marketing chief as the company looks to regain the market share lost to Apple's ever popular iPhone and the army of handsets currently running Google's Android mobile OS. RIM recently announced quarterly losses of $125 million as the Canadian firm continues to struggle with declining smartphone sales. 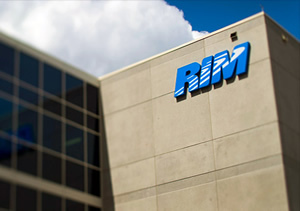 The final results marked a huge reduction from the fourth quarter period of 2011 in which RIM made a $934 million profit. At the time, the company announced a management shakeup which saw 20-year veteran Jim Baisillie step down from the board, as well as the CTO and COO for global operations leaving. Frank Boulben has been hired as the firm's new chief marketing officer, described by CEO Thorsten Heins as a critically important position. Boulben, 45, leaves his previous position as executive vice president for strategy and marketing at LightSquared, which has been struggling since Sprint jettisoned its partnership with them after US regulators killed off any plans it had for a nationwide broadband network. Kristian Tear has been recruited to fill the chief operating officer position. Tear, 48, joins the Canadian phone maker after leaving his role as executive vice president for Sony Mobile Communications, a unit of yet another struggling technology company, Sony Corporation. "Kristian and Frank bring extensive knowledge of the rapidly changing wireless global market and will help RIM as we sharpen our focus on delivering long-term value to our stakeholders," said Thorsten Heins, RIM's CEO in a statement on their website. "Most importantly, both Kristian and Frank possess a keen understanding of the emerging trends in mobile communications and computing." RIM took the first steps towards making a recovery with the preview of its upcoming QNX-based BlackBerry 10 OS at the BlackBerry World conference in Orlando last week. Developers in attendance received a prototype smartphone to begin writing and testing applications ahead of the mobile OS' launch around October.